Report of CWO militant After the March 26 Demonstration. The demo itself was just as we predicted - unfortunately. A hell of a lot of people but no single thread to the 'demands' or slogans; many people just had their own slogans. It was very closely stewarded by the TUC itself - they didn't need the police. Everyone just filed up the Embankment to Hyde Park and filed out again after (mostly) passively listening to a few speeches (not even sure who was speaking apart from Miliband). There were still people coming into the Park while others were leaving and the speeches were over. The feeling was of people looking for a solution but with no idea what to do next. It’s cold comfort to report that the TUC’s so-called ‘march for the alternative’ went off like the proverbial damp squib. From the point of view of turnout it was impressive enough. 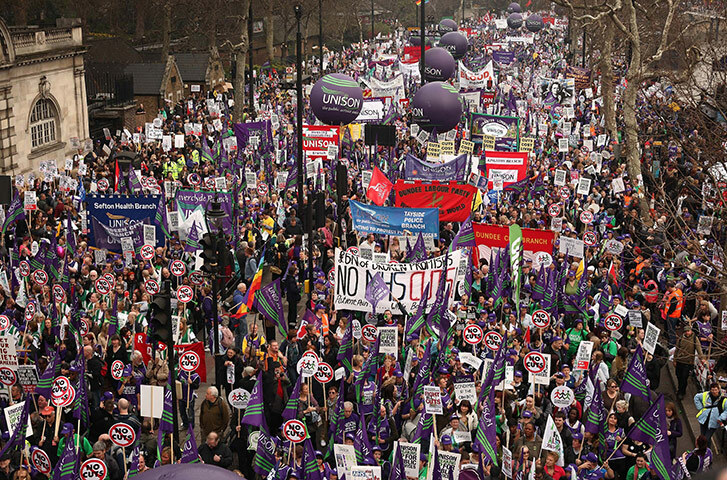 Most commentators reckon there were half a million people and acknowledge it was the biggest demo in London since the 2003 protest against Blair’s decision to join in the invasion of Iraq. However, aside from the numbers and the obvious sincerity of the protestors (many had come armed with their own, more imaginative, slogans) the event was further confirmation of the lack of any alternative being put forward to the existing political and economic set-up. On the contrary, the tightly organised, carefully stewarded procession which the TUC had already largely restricted to public sector workers and which - with the aid of the police - was kept immune from ‘unauthorised’ feeder groups, notably a whole contingent of students (i.e. not simply “troublemaking rabble”) - was a clear echo of the insidious, divisive role the unions play under the guise of organising a fight back. For a start, simply because the issue of the hour is the Con-Dems’ £80bn state spending cut programme, does not mean that the effect of those cuts is limited to workers employed by the state nor even the people immediately affected by the loss of a local service. The TUC was ready enough to have the ‘victims’ of social service cuts march alongside the bands of public sector workers who face unemployment or increased work loads, a two year wage freeze, pension cuts while payments from their wages go up … but where were the contingents from the rest of the working class? The real issue is that the working class as a whole is being made to pay for the capitalist crisis. Not just here but worldwide. Moreover, despite all the rhetoric about greedy bankers, this crisis stems from the contradictions at the heart of capitalist production where the companies responsible for manufacturing, extracting, even agricultural production, all essential to the ‘real’ economy are driven by the necessity to increase profits and yet the more effectively they do so the more the general rate of profit declines. For decades capital has been striving to reduce its costs of production in order to combat the low rate of profit, no more so than what bosses the world over regard as their most expensive ‘cost’ - wages. This is glaringly obvious when it comes to the shifting of production to China and other areas of cheap labour power (i.e. rock bottom living standards). What is less obvious is that this is not the end of the process. For capital now the benchmark for wage costs is defined by Chinese, even Vietnamese or Bangladeshi wage rates, a benchmark which brings its own logic to the established heartlands of capitalism: the necessity to reduce wage costs even further, not simply by individual firms making direct wage cuts but by a general lowering of wages and the undermining of a welfare cushion which at its most basic guaranteed a certain level of survival for people unable to work and protected people without a job from having to work for next to nothing. This is not to deny the financial crisis and its knock-on effects for government finances or the cost of servicing the enormous national debts that suddenly swelled when the richest states in the world, from the USA through the EU to little old UK, found themselves with no alternative but to take over the debts of the financial sector when the speculative bubble finally exploded. The fact that the bubble was actively encouraged by governments and financial authorities worldwide by low interest rates, relaxation of consumer credit regulations and the general deregulation of the banking and financial sector, is now being forgotten as the whole thing is presented as the result of … greedy bankers! Their rates of return on capital were attractively high due to the ‘excess liquidity’ from the ‘real economy’ (i.e. the capital which was not being invested in production because bigger profits could be had from the financial sphere). 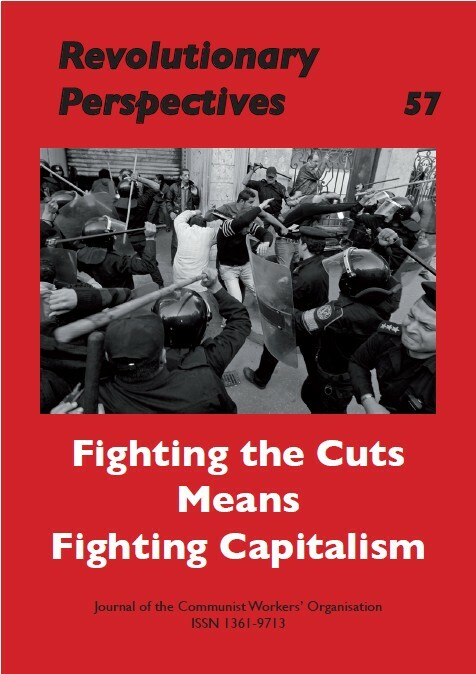 In other words, the ‘credit crunch’ and the bursting of the financial bubble are part of a much deeper and intractable capitalist crisis which has now lasted for decades, with each downward spiral leaving the capitalists and their governments with less and less room for manoeuvre and, from the capitalist standpoint, with no option but to attack the working class. In fact, the crisis over budget deficits has been seized on by governments everywhere as the opportunity for a general and head-on assault on the working class in general. Of course, this is not how it’s being presented. The overarching theme is still that ‘we are all in this together’. Like one big family which has mismanaged its finances and which now must work together to pay off its debts, ‘the nation’ must pull together and accept sacrifices in this difficult time of austerity. Which brings us back to the TUC and March 26. Unlike households, sovereign nations can print money, raise taxes and fund debt over many decades. Massive cuts are a false economy. As we saw in the 1930s, austerity begets more austerity - more unemployment, more misery for working people, and yes, more national debt. within a decade we had got the economy back on track, built the NHS, extended the welfare state, and constructed millions of council homes. And through growth and full employment, Britain also got its deficit down. What he fails to see is that the post-war recovery and higher growth rates (read rate of profit) was predicated on six years of global war, involving massive austerity, not to mention loss of life, capital destruction and the running of machinery and equipment into the ground, all of which were necessary to prepare the way for capitalism’s revival. Deficit financing was the capitalists first response to the present global crisis. It was ditched in favour of ‘monetarism’ and ‘free markets’ in the face of rampant inflation and the collapse of the post-war Bretton Woods fixed exchange order. His call now for an injection of state funding (unfortunately he seems to think that quantitative easing in the US has done the trick. Hasn’t he heard of Wisconsin?) is sure to fall on deaf ears. Let's keep people in work and get our economy growing. Let's get tax revenues flowing and tackle the tax cheats. And let's have a Robin Hood Tax on the banks, so they pay us back for the mess they caused. Not a word about the working class, much less ‘socialism’. He did, however, manage to mention that “We do need to cut the deficit.” (Just in case ‘middle England’ began to think he was a raving militant). Clearly the only alternative on offer is the prospect of Labour returning to office at the next election. Too soon, of course, to openly call for that but it’s a prospect implicitly endorsed by the likes of Socialist Worker (with its headline ‘Drive Out the Tory Scum’) and the rest of the platform speakers proclaiming platitudes such as this government has ‘no mandate for these cuts’. (Barber had already claimed to be speaking for the people of Britain.) Meanwhile, before the next election, we can all go back to our localities and ‘fight the government's brutal cuts in our workplaces and our communities’ (Barber again): lunch time ‘strikes’, for example … or what about day schools? Then of course there is the demo of the ‘Hardest Hit (disabled) outside Parliament on 11 May... And so on. Even today there are grassroots militants who are prepared to fight tooth and claw for a real class struggle within the frame of the unions and inside the capitalist political set up. This is touching (we are not intending to be sarcastic) but ultimately a fruitless endeavour. The National Shop Stewards Network, for example, who believe that the 26 March demo gave a boost of confidence to the struggle against the cuts and are advising their members to go to their union branch meetings with proposals to co-ordinate strike action and motions that the unions combine to plan for a ‘24 hour public sector general strike’ [sic]. Their attempt to be ‘realistic’ exposes the futility of relying on the unions to generalise (i.e. strengthen the class struggle). pledge to oppose all cuts in council jobs, services, pay and conditions. We will campaign against the idea that 'some cuts' are necessary. is simply a regurgitation of Old Labour’s Clause 4: the myth that nationalisation equals socialisation. This sort of thinking, together with the belief that working class interests can be seriously defended inside the capitalist council chambers is the sort of thing communist militants have to be able to answer. In the months and years of struggle ahead, the onus is on revolutionary internationalists to put flesh and bones onto the communist programme. To remind working class militants that it is not enough for workers to take over the existing state, but that they have to overthrow it. In the more immediate term the question needs to be posed about how the struggle can be extended: for sure not by keeping to union boundaries, nor to the unions’ acceptance of capitalist legality (for example over ballots for strikes). As the crisis intensifies there will be a torrent of nationalist propaganda from all factions of the ruling class. A true socialist or communist will be distinguished by rejection of the old Labour claptrap about nationalisation (or ‘public ownership’ of the means of production) by their awareness that the capitalist crisis is global, that the working class is an internationally exploited class and that the answer to the iniquities of the present system of production for profit is for the working class world wide to take over production and institute direct democracy - based on immediately recallable delegates in communities and workplaces - in order to directly meet social needs. At least Labour and the TUC have stopped pretending they stand for socialism. Nobody should now pretend that they can be the vehicle for anything other than the preservation of capitalism. The task of the internationalists is to win over militants to the only viable alternative for the working class: the political struggle for the overthrow of capitalism and its states, a struggle which above all requires that workers en masse take up the communist programme. That is what we are working towards in the long term. To achieve this we appeal to those who broadly agree with our perspective to get in touch with a view to reinforcing the struggle against this iniquitous system.